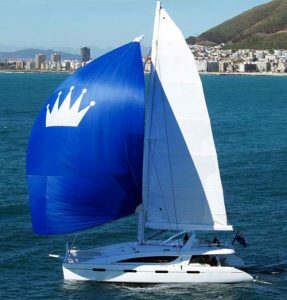 Mediterranean yacht charter KINGS RANSOM – Sail the Mediterranean with this wonderful and talented crew. Kings Ransom is excited to announce she is chartering in the Mediterranean Summer 2019! Kings Ransom had an extensive refit last summer and is looking amazing to start the season. The Kings Ransom team includes experienced captain and professional chef team Niv and Liron. Stefani a qualified physiotherapist and charming stewardess along with Pedro , the water loving first mate. Offering vast amounts of luxurious living space including an expansive cockpit equipped with two double aft lounge beds and a large teak table comfortably seating up to 10 guests for dining. Once inside the spacious saloon guests can indulge in an exquisite cocktail at the bar, unwind with a quiet read on the sofa or set up for a game or two on the perfectly polished saloon table with sweeping seating area. The imposing panoramic exterior windows hide the majestic master cabin fit for royalty, whilst the remaining guest suites all have queen berths, each with private en suite bathrooms. The remarkable deck and upper cockpit offer plenty of freedom for movement, with ample spaces for sun lounging, relaxing in the Jacuzzi and socializing.